Construction: MPP Series capacitors are constructed with metallized polypropylene film dielectric, copper clad tin plated leads and epoxy resin coating. We are one of the trustworthy firm, involved in offering a wide gamut of Metalized Film Capacitors to our clients. All offered products are widely appreciated by the clients due to their accurate results. Metalized film capacitors are smaller in size compared to film/foil versions, but have lower pulse rating. The failure mode is open circuit. There are various special constructions combining the higher pulse ratings of foil types and self healing properties of metalized capacitors. These are double metalized, series, and series metalized / foil constructions. 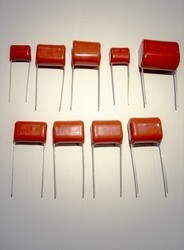 The MKP type capacitors consist of low-loss dielectric formed by pure polypropelyene film. A thin self-healing mixture of zink and aluminum is metalized directly one side of the PP-film under vaccum. 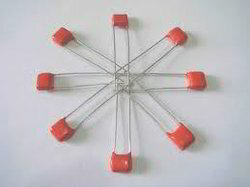 This technology ensures long operating life of the capacitor. IGBT protection circuits, Snubber networks, Energy conversion and control in power electronics, Protection circuits in SMPS. We provide our customers Domestic Film Capacitors, which is developed employing exceptional quality material at progressive infrastructure facility.